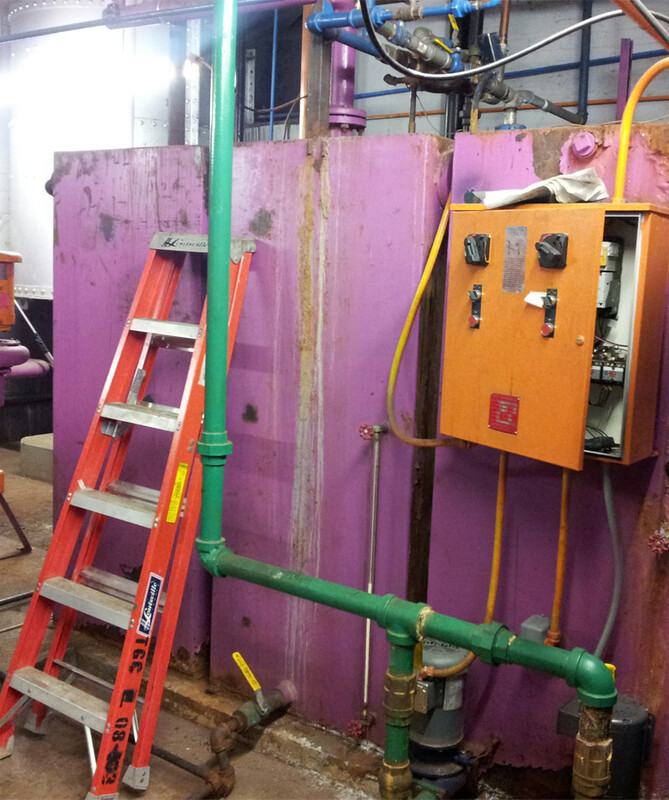 An existing 30-year-old boiler feed system providing heat to a high-rise building located at 1 N. LaSalle in Chicago was recently replaced because the existing tanks were failing. Previous Boiler System in Need of Replacing. If the tanks fail there would no longer be a way to feed water to the boiler for heating the building. Located in a sub-basement, the mechanical room is two floors below street level. With access through only smaller freight elevators to get equipment down to the mechanical room, it was impractical for most standard feed systems to be provided. Metropolitan Industries designed and fabricated a custom feed system with a “split” design that was brought down to the building’s basement in sections. The system was designed for best performance, cost and lead-time. The system was designed in two parts so that the system could be assembled in the field and welded accordingly. This allowed for a mechanical contractor to weld and assemble the finished system on-site in the mechanical room. This design helped produce a quick turnaround. A quick turnaround time was imperative due to the cold weather that was approaching when the project was first out for bid. Too often experts walk in and just replace what was already there. Metropolitan is unique because of our specialty in innovative solutions and the ability to think outside-of-the-box. We designed and supplied a complete turnkey solution for the end-user with the end goal to provide a more reliable and easier to maintain system. The design incorporated an elevated tank with vertical multistage pumps, designed to pump 80 gpm of boiler feed water at 20 PSIg to two low-pressure steam boilers. Replacing the original floor mounted system with elevated vertical multistage pumps was a better option because it created a long-term, reliable solution for the customer. Metropolitan also designed the system with a new control panel and electric pump alternation. 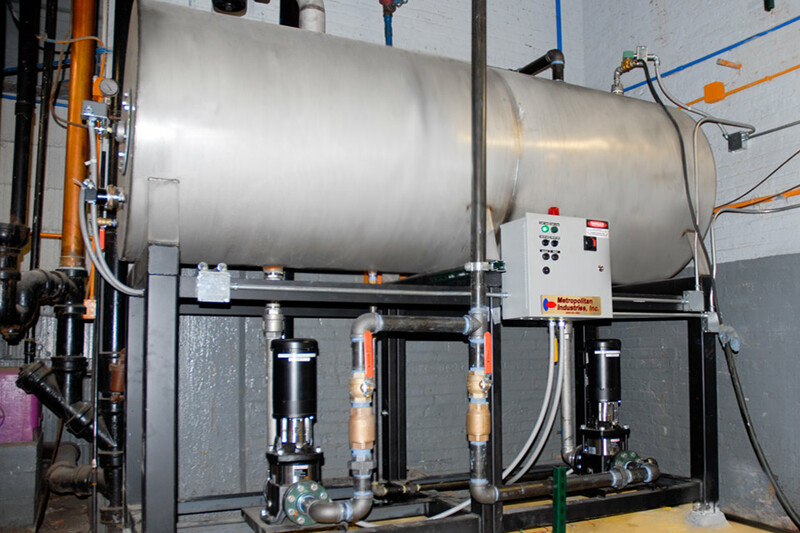 The new system incorporated a custom stainless steel tank that allowed for more corrosion resistance to the condensate returning from the building. The tank was elevated to provide the Net Positive Suction Head (NPSH) required to protect the new feed pumps from excessive maintenance and seal failure. The new tank was fitted with a make-up water fill valve assembly, sight glass and low water cut-off feature which will protect the pumps from running without water. Part of our commitment at Metropolitan is providing equipment to best suit our customer’s particular applications. Customer specifications are of paramount priority and the knowledge that comes from our mechanical department further extends our commitment to providing products tailored to meet customer’s needs.